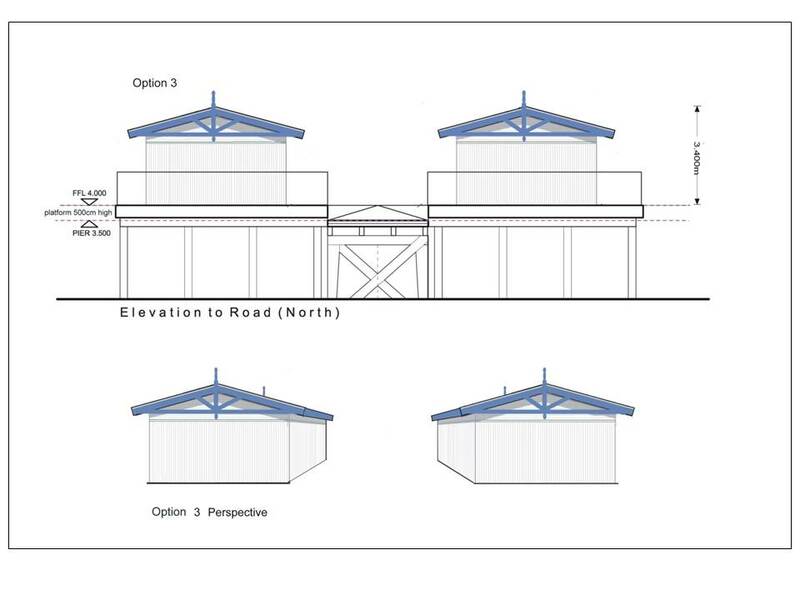 We had an interesting question from Brian: “Hi – please advise if the original pier had buildings, such as proposed, on it. 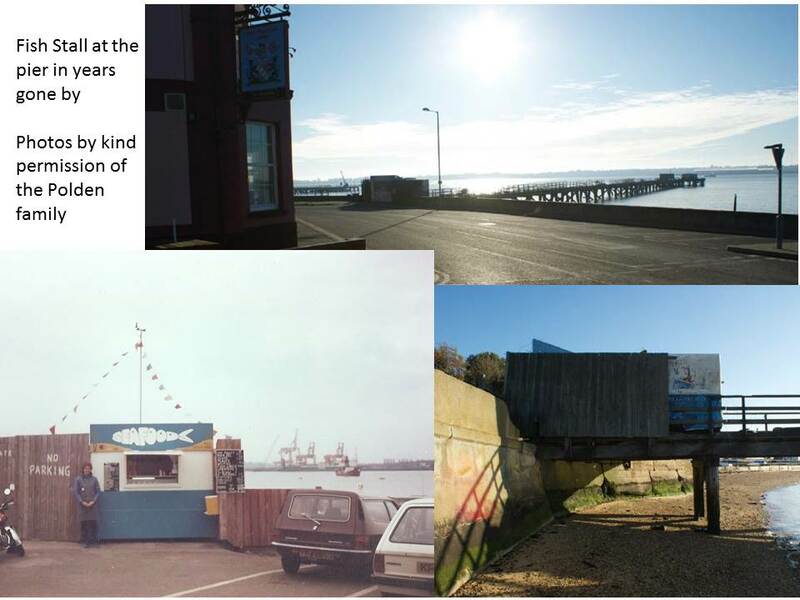 Thanks and regards.” We are not sure if many people remember the old fish stall that used to be at the land end of the pier, so here is the information. The pier was owned by the Polden family, Pat Polden being well remembered in the area as a commercial fisherman. His widow and daughter are active supporters of our plans, and have shared their family photos with us to show you. Pat used to land his catch at the hammerhead, and his wife and daughter sold the fish at the stall at the pavement end, some 650 feet away. Amazingly low food miles from catch to sale ! Their fish stall was partly on the pavement, partly on the pier as there were no platforms to the side. This wouldn’t be appropriate for our proposed buildings, partly because the pavement is now adopted by Highways Authority. 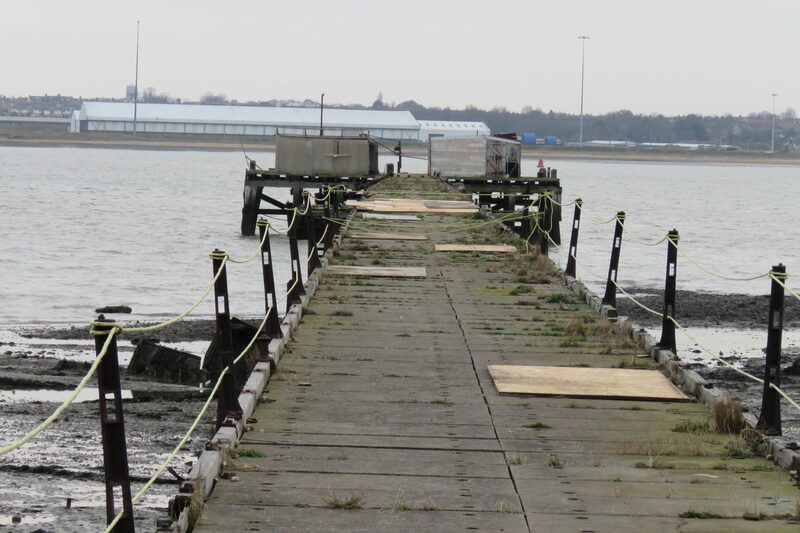 But the main reason is that we want to keep the pier clear for walking on. The lapsed planning permission for platforms either side was a key part of how we develop community access at the same time as providing facilities at the pier. We had the fantastic news that the Coastal Revival Fund has granted the pier £50,000 which can be used very quickly to commence work on restoring and developing the pier. This fund is provided by the Ministry of Housing, Communities and Local Government as part of its national initiative to provide economic development to coastal areas for “The Great British Coast.” The publicity for awarding millions of pounds in grant aid all around the British Coastline says ” The fund will support projects to help revive heritage assets that are important to local communities but have not yet reached their full potential or are facing neglect.” That is a very accurate description of 1235 year old Shotley Pier, and fits very well with the Babergh District Council giving priority to encouraging tourism and leisure on the Shotley peninsula. Another funder immediately let us know they could consider “matching” the grant raised, so we have now applied to them for more money ! Many people have asked us about the new housing development happening on the beach next to the pier. Planning permission was gained some years ago for this beach development, but only started in 2018. This photo, taken from the pier itself, shows the first three houses being built. 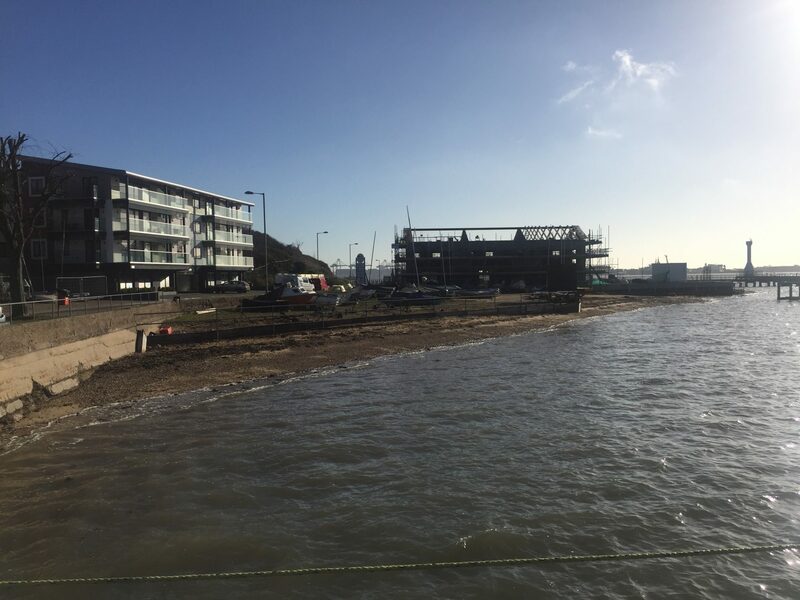 The developer recently completed flats on King Edward Drive facing the harbour (on the left of the photo), and their next stage is to build houses on the beach area. The photo shows the roofline taking shape for the first three homes which are designated to have workshop space on the ground floor with two-storey homes above the workshops. The overall height of this block of three houses will be 10m (33 feet) tall. Their original plan had a curved roof but there was a minor amendment last year to have a pitched roof. 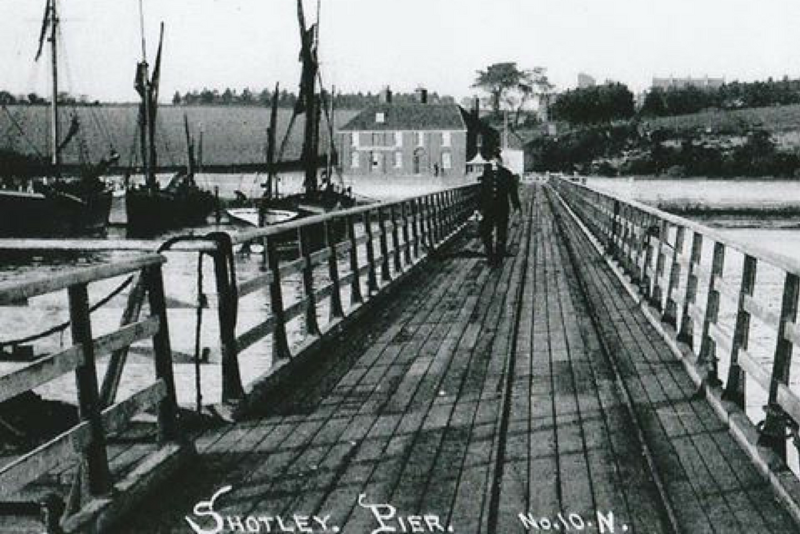 These three houses face Shotley Pier. Their next stage will be to build more houses further out on reclaimed land, these will be facing Harwich. 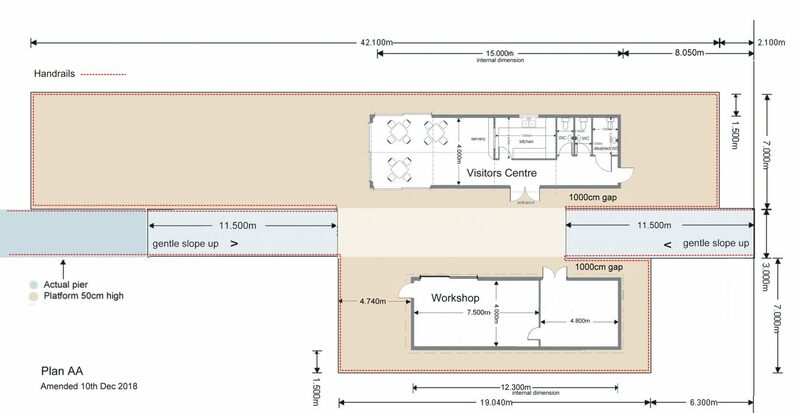 This section of houses goes further out than the proposed pier visitor centre, so anyone sitting in the proposed visitor centre looking to the seaward side would get a view of the beach housing estate rather than the original distant sight of Felixstowe docks. 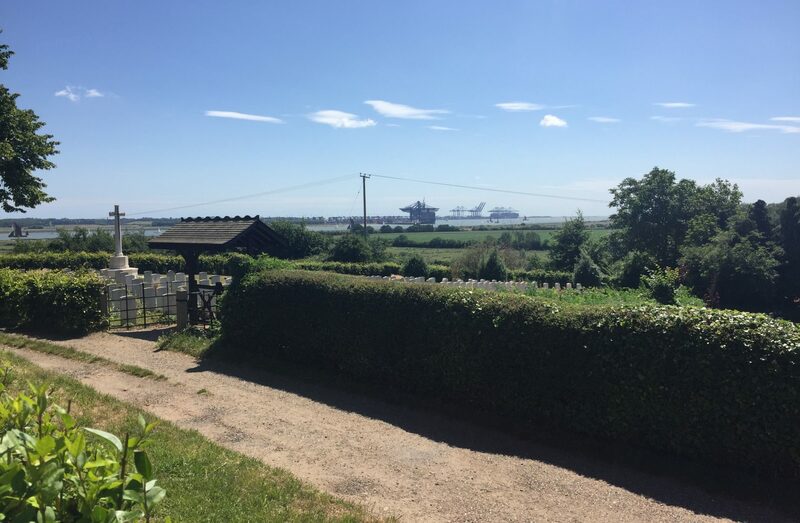 Visitors will need to walk further out along the pier promenade to get a view of the sea-ward side of the harbour or Felixstowe docks. The pier promenade section does extend further into the river than the housing estate. The up-river views will not be affected. The final section of beach housing to be built will face Felixstowe docks. The developer also has existing planning permission to build more flats around the corner at the Marina. We are very sad to report that one of the artists closely associated with the pier project has passed away suddenly. Art has been very important to the project, as the pier position makes it easy to appreciate the sunsets and the river environment. 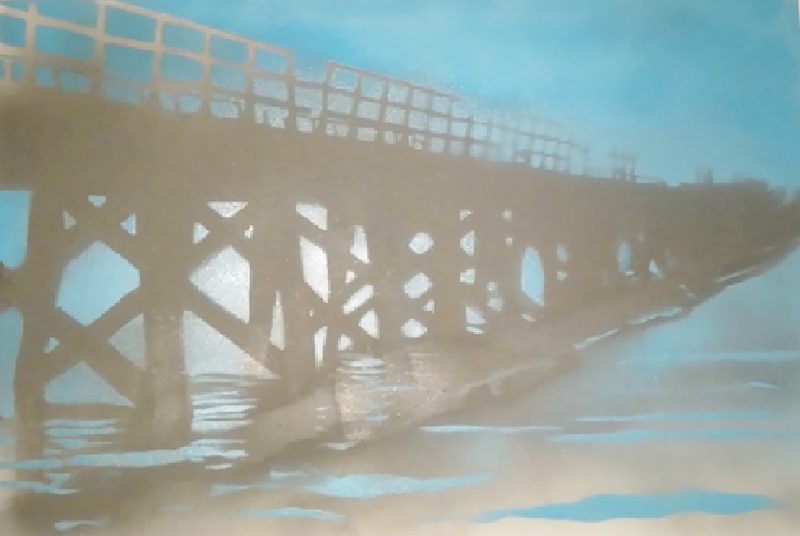 Christine Hillier had been involved in the art of the pier from the earliest stage, her wonderful moody blue piece and other items being sold at our first fund raiser event, our Art Auction in 2017. She went on to provide art for our first coffee morning at the Red Lion in December 2017, which proved so successful that the owners offered to host a monthly “artist of the month” event at the Red Lion. Christine’s art was chosen to launch this event due to the popularity of her work at the previous events. Her next piece “Love Me” will eventually hang in our visitor centre. Our sympathies to Christine’s family. 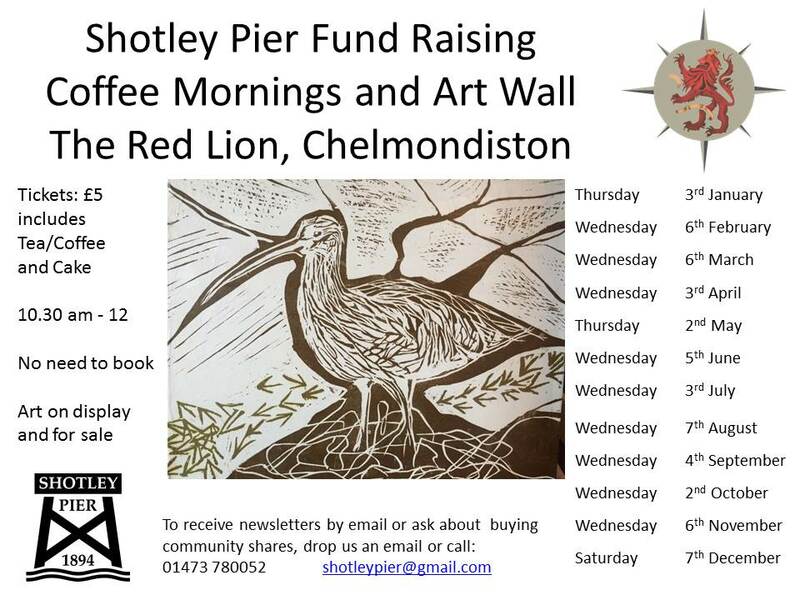 Michelin listed Red Lion, Main Road, Chelmondiston IP9 1DX hosts a monthly coffee morning to raise funds for Shotley Pier. 10.30 am to 12 once per month Tickets are £5 per person, which includes tea or coffee plus a delicious slice of home made cake, donated by our talented volunteers. The artist of the month speaks for a few minutes, and you can chat to the artist about their work if you wish. Art will be on display on the Art Wall at the Red Lion for the rest of the month, and is available to buy. No need to book, just come along and enjoy the friendly atmosphere and comfort of the Red Lion.